Desert Princess Golf Course. Golf Desert Princess. Desert Princess golf course details and information about Desert Princess Country Club in Cathedral City, California. 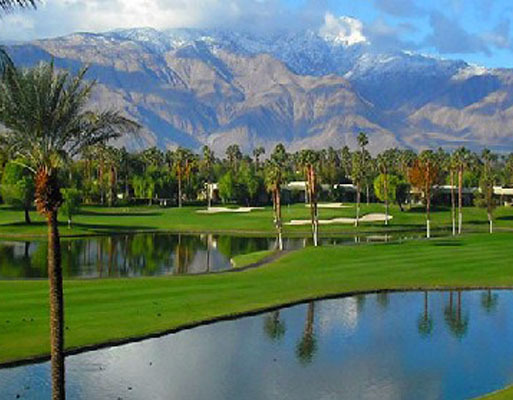 Desert Princess Country Club has 27-holes of public golf on 3 different courses. All 3 Desert Princess golf courses have different challenges and gorgeous mountain views. Golfing here is fun for golfers of all skill levels. The greens are tiff dwarf Bermuda, among the best in the desert. Desert Princess Golf features 85 bunkers and 21 lakes, so golfers do require carts for the game. There is also an all-grass practice facility that includes a golf academy and practice bunkers. In addition there are large practice greens offered for putting and chipping putting. Leon’s at Desert Princess is the on-site restaurant and clubhouse. Other Desert Princess amenities include a golf shop, a fitness center, meeting rooms, and a full-service spa with sauna, hot tub and lap pool. Other sports at the Desert Princess Club include tennis courts, basketball courts, pickle ball courts, bocce ball, and horseshoes.